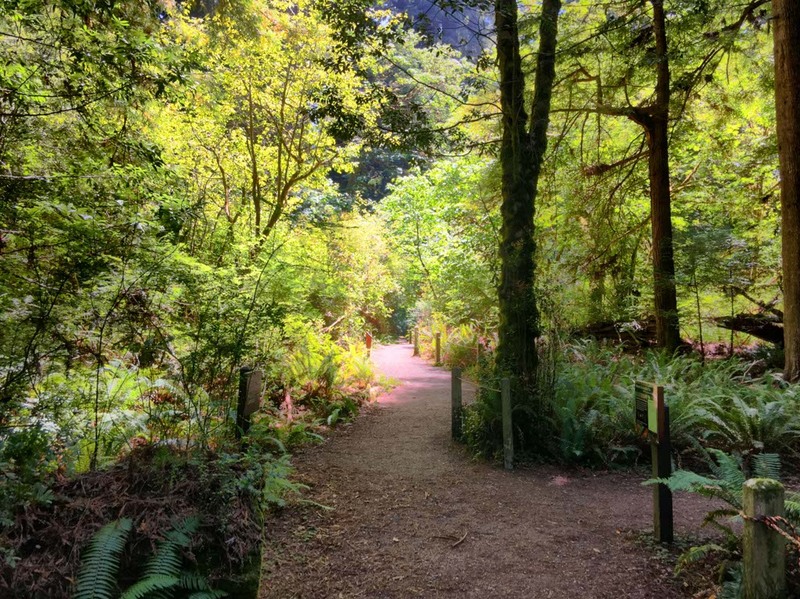 A wonderland for nature lovers, Humboldt County is renowned as the home of the coast redwoods. Half of the remaining old growth survivors of this ancient species reside here, including the world’s tallest tree in Redwood National Park and the amazing champions along the Avenue of the Giants. The 2,000 year old big trees are only the beginning of a Humboldt County family adventure. 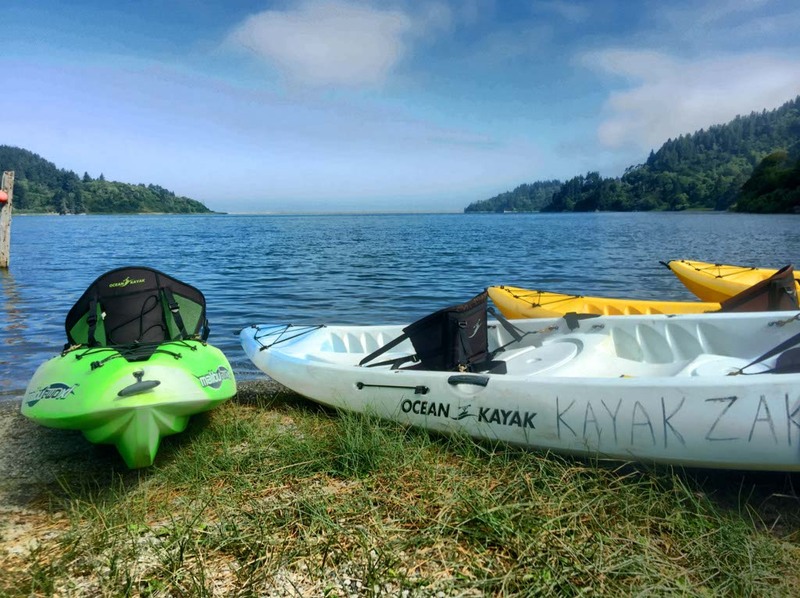 Camping, kayaking, wildlife viewing, and magical trails are waiting to be discovered. I connected with Athena in Humboldt County more than anywhere else in California or in our four years of exploring together. 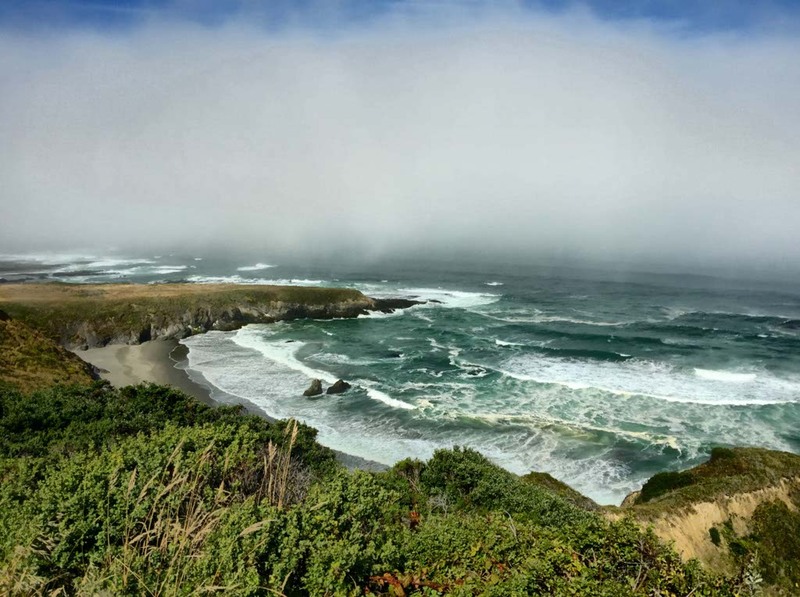 We arrived at Humboldt County via car, but we wanted to be part of nature in this wildly beauty place. 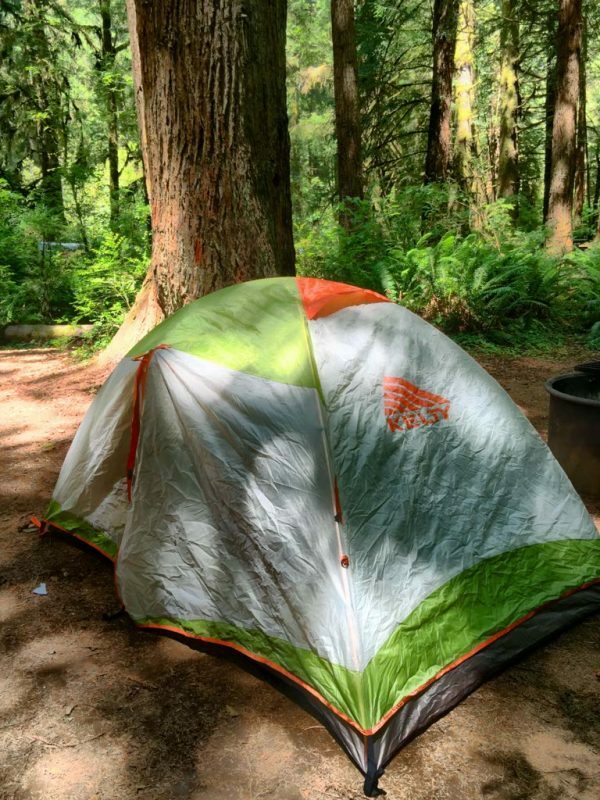 Rather than trying to pack our camping gear, we received gear from GetOutfitted, where you can rent or demo the coolest gear on the market and have it delivered directly to your doorstep or destination for easy one-time use. A 10-mile scenic drive through ancient redwoods on Newton B. Drury Scenic Parkway, Elk Prairie Campground was our home for the night. 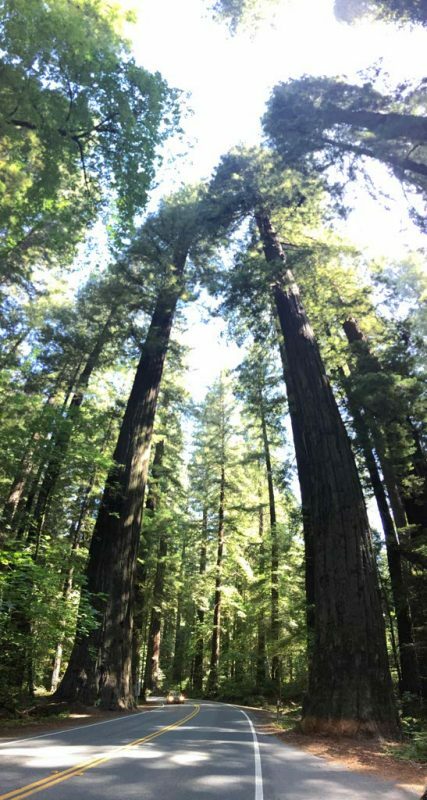 Many of the biggest, tallest and most awe-inspiring redwoods are within minutes from the campground. All trails radiating from the campground center are winners, but we opted for the Revelation Trail Loop and the Cathedral Trail, which included the iconic Big Tree. Together, we set up the tent. It was a simple process, but one that I wanted Athena to experience with her mom. I pulled all of the pieces out of the bag and laid them on the ground, asking her which ones she thought went together. She played with the poles and watched them click into place. She found the hooks that attached to them and tried to clip them together. It was baffling how simple she made it seem. Without any help, she managed to figure out where to put the poles and I helped her hold up the tent so she could see the shape it was going to form. She didn’t know how to attach the cover but I pulled it over and we worked as a team to line it up properly. When it was finished, we high-fived for a job well done. Inside, we laid out our sleeping bags and she was beaming with excitement and asked if we could tell spooky stories and eat marshmallows. Since there is no food service in Redwoods National & State Parks, we drove back into the town of Orick and stopped at a small market called Shoreline Deli & Market for treats. Before returning to the campground for the night, we drove to Fern Canyon. From Highway 101 at Orick, we drove the unpaved Davison Road 10 miles to this spectacular canyon. 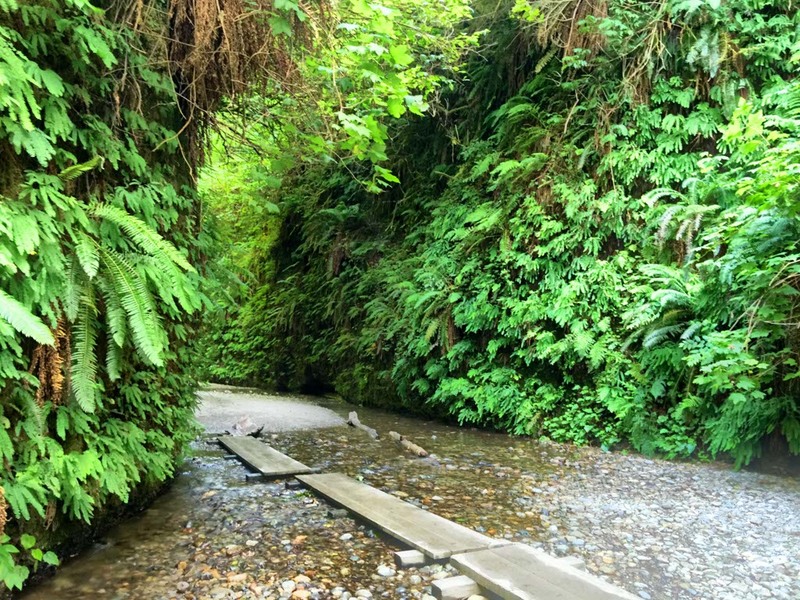 It’s a hidden paradise of ferns lining a narrow gorge. Some of the seven different types of ferns clinging to the steep cliffs are ancient species, with ancestry tracing back 325 million years. Living underneath their leafy shade are some eye-catching amphibians, including Pacific giant salamanders, which can measure nearly a foot in length. The trail follows a series of small footbridges deep into the canyon. Drooping ferns create hanging gardens, miniature waterfalls pour down rock faces, and moss wallpapers every surface. Every curve and turn leads to another photo-worthy view. Athena hopped along the bridges in the canyon in one of the most beautiful displays of childhood innocence and imagination. We were explores in search of adventure and new lands whether they are in our backyard or in a ferny wonderland of mysterious discoveries. We returned to the campground rejuvenated and connected through our peaceful time together in the canyon. It was time for marshmallows and stories. Athena told scary tales of wolves and bears as we ate treats and created memories. Kayaking with Kayak Zak’s, a few miles south of the park, in Stone Lagoon was our morning adventure. Athena is getting quite good and paddling and singing at the same time. We saw many birds and even a herd of elk while we paddled around the entire lagoon. It took us two hours to make the full loop but it wasn’t a difficult paddle. The waters were calm and we were the only kayaks on the lake. There are certainly benefits to being early risers. The North Entrance to Avenue of the Giants was 69 miles from Kayak Zac’s. Athena was exhausted from her wild night followed by an early morning on the lagoon. I looked back at her as we pulled onto the highway and she was already asleep. I didn’t wake her until we entered another world filled with giants towering over us. 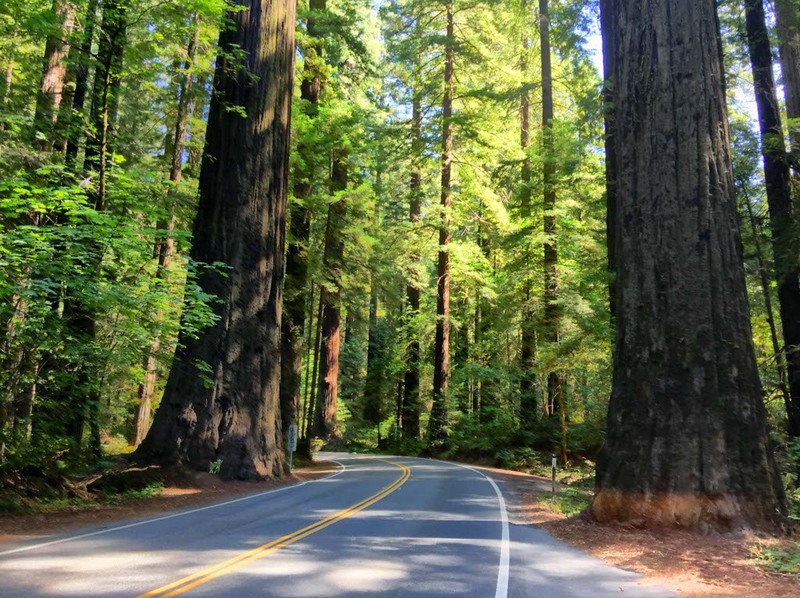 We embarked upon a leisurely drive, winding down a breathtaking road featuring some of the most massive redwoods ever seen. Trailheads and side roads beckoned. We brought snacks and drinks. We brought our sense of adventure. We brought our soul. And we walked with giants. My heart was full. We were home. Wherever she is, is home to me. 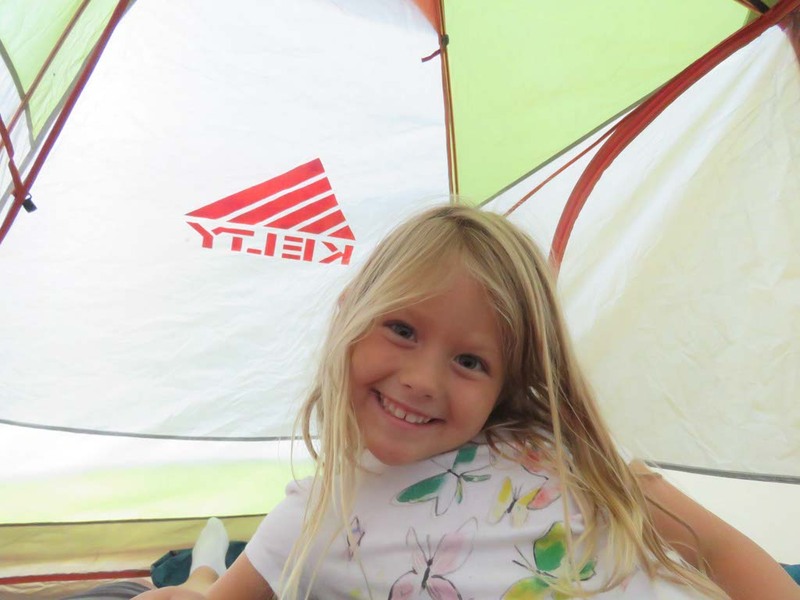 Humboldt County was a place for Athena and I to connect through conversations, stories, imaginative play, discovery, adventure, and love. I’d like to return yearly and bring each of those memories to light again and then create new ones. This is where magic happens. You picked a wonderful place to camp. It’s beautiful country up there. Glad to see Athena smiling and a smile in your writing. When I think of California, I only think of beaches and sunshine. This is an even greater reason to visit the area. Wow! Northern California looks like such a beautiful place! I love Stone Lagoon. Such a pretty spot (and always elk nearby)!